White Nitrile (Buna-N, NBR, Nitrile butadiene) Rubber is a high quality sheet rubber in a non-marking white material. 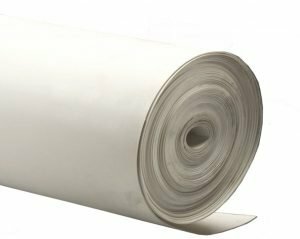 White Nitrile Sheet is designed for clean applications including food, pharmaceutical, and cosmetics, including those requiring oil resistance. Offered in 48 inch wide rolls, it can also be slit to width or custom cut to your specifications. White Nitrile rubber can withstand contact with food grade oils and general applications in clean facilities.